Trophic cascades are a well-known phenomenon where the removal of predators often causes an explosion of prey species’ populations due to reduced predation rates. However, an often overlooked facet of trophic cascades is that changes in prey behavior that can also result from reductions in predator abundance. A frequently cited example of such a behavior shift comes from a study conducted in Yellowstone National Park. 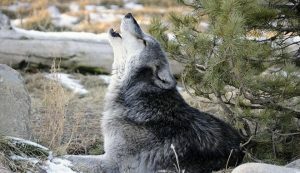 When gray wolves (Canis lupus; Figure 1) were reintroduced to area, elk that grazed within the park became more likely to take cover in pine forests. This predator-avoidance behavior allowed for increased growth of aspen stands along the river banks, the preferred food of elk. Recent research has found that similarly processes take place underwater. Coral reefs are filled with a diversity of species with myriad complex interactions occurring all at once. Multiple predator and prey species interact on many levels in the ocean, with sharks often being the top predator. A study conducted by Dr. Neil Hammerschlag and a team of researchers looked at differences in physical features in prey species on two adjacent coral reefs in northwestern Australia; one of which has been a target for Indonesian shark fisheries for over a century and as a consequence has reduced the numbers of sharks living on the reef, the other is a marine reserve with significantly higher abundances of sharks. Between 2012 and 2014, individual fish of 7 species resident on both reefs were photographed and measured (Figure 2). The digital photos were analyzed further in image analysis software to measure finer scale differences in specific body features such as the size of fins and eyes. Larger eyes and fins provide an advantage for detecting and avoiding predators. 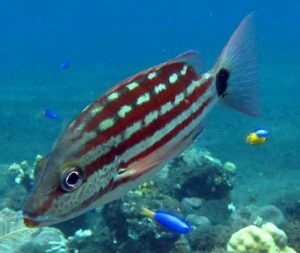 The researchers found that fish living on reefs with depleted shark populations had much smaller eyes and tail fins compared to fish living on reefs with more abundant shark populations. However, it is not clear whether these physical differences are long-term evolutionary changes or just short-term responses to the absence of predators. Additional genetic analysis is necessary to parse out the details of these differences. Nonetheless, this study showcases an interesting consequence of predator removals. Namely, that changes in predator abundance within an area can have far reaching influence on fish populations ranging from their abundance and behavior to their physical make-up. This study provides one example of how the presence of predators can shape prey species on a fundamental level. Coral reefs are one of the most imperiled habitats on the planet. Therefore, understanding the roles of top-level predators in these communities will be one of the most important areas of conservation research in the coming decades. Hammerschlag, N., S. C. Barley, D. J. Irschick, J. J. Meeuwig, E. R. Nelson, and M. G. Meekan. 2018. Predator declines and morphological changes in prey: Evidence from coral reefs depleted of sharks. Marine Ecology Progress Series 586:127–139. Previous story Sawfly, Don’t Bother Me!